Victoria Pier: Trips leave from near the end of the Victoria Pier. Walk around the Cobb on the road level, past the buildings and the boat will pick you up from the steps on the harbour side near the end of the harbour wall. If in doubt, do ask. When should I turn up? Please arrive 30 minutes before your trip is due to leave. We aim to have everyone on board 15 minutes before departure so that we can sort all the tackle and bait out before we leave the harbour. Layers: Even on a warm, sunny day, we recommend that you bring layers of warm clothes and wear long trousers/jeans. Waterproofs: Waterproofs are a good idea – not only to keep you dry if it rains but also to keep your clothes clean and act as a wind break. Deck seating areas sometimes get sprayed from waves too. If you bring waterproofs you always have the option of wearing them! Shoes: Wellies or shoes you don’t mind getting wet. Something with a bit of grip is a good idea. Many of our regular anglers wear waterproof boots even on sunny days. Water: We will supply you with tea or coffee, but it’s a good idea to bring a bottle of water or something that hydrates you. Lunch: If you are booked on a whole day fishing trip bring some lunch and snacks. It’s amazing how hungry you get in the fresh air. It’s probably best to avoid fatty/greasy foods although one of our regular anglers brings a dozen doughnuts on every trip! We have a fridge and microwave on board so you can heat up pasty or keep a sandwich cool. We can provide lunches for an extra cost of between £5 and £10 each (subject to availability). Sea sickness tablet: Even if you don’t get sea sick, a good sea sickness tablet is a good idea, taken an hour before you travel. In our experience the best we’ve come across is Dramamine Original (dimenhydrinate) but it’s only available online. Failing that, a brand with Meclizine in it can work well and are non-drowsy. We’ve not had great experience with brands that contain Cinnarizine such as Stugeron. Bags: If you want to take your fish home with you then you will need some good, waterproof carrier bags or even a small cool box. A cool box is a good idea as you can put your lunch in it on the way out and your catch in it on the way home! Where can I park/what does it cost? 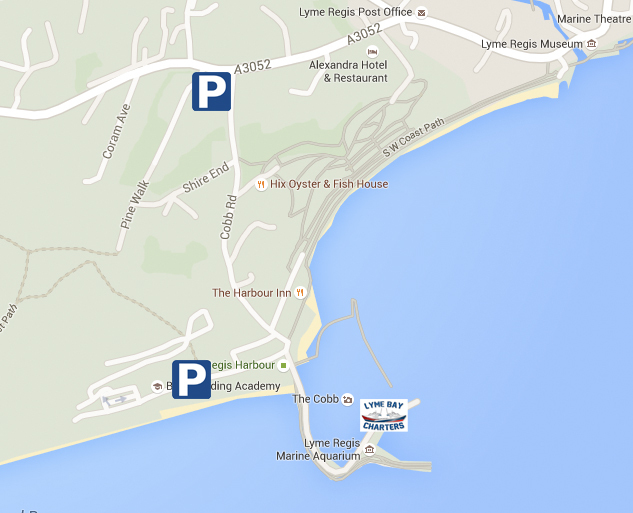 Cobb Parking: You can park in either the Town/District Council car parking at the bottom of The Cobb to the West of the harbour. It costs £1.20 per hour. Holmbush Car Park: You can park in the larger car park at the top of the Cobb Road. This costs £2 per day. Most anglers drop their bags at the bottom then drive back up to the top car park to park. Public WC Faciities: There are loos at the top Holmbush Carpark and by the harbour next to The Cobb Arms public house. On the Cobb: There is a men’s urinal on the Victoria pier – near to where the boat is boarded. On board the boat: There is a private flushing loo on board the boat. If I get seasick will we return to the harbour? Seasickness: If you get ill and we are a long way from the harbour, unless all the other anglers agree to take you back, or we believe you require medical attention, unfortunately you will have to ride it out. The tips are, take a travel pill before you leave, stay out of the cabin, keep your eyes up and on the horizon as much as possible, and avoid fatty/greasy foods, alcohol and sugary drinks. Bait: Bait is included if you are paying to hire rods. A small surcharge may be made for some trips where large quantities of Ragworm or other more expensive baits are required. If you are using your own Rods and tackle then you will either need to provide your own bait or ask us to provide at a small extra cost. Is it extra to hire rods, reels and tackle? Rod and Reel: Many anglers like to bring their own kit, however we can supply you with a rod and reel for a supplement of £5 for 4 hour trips, £7.50 for 6 hour trips and £10 for full day trips (8-10 hours) Shark fishing is £20 per person per trip. Tackle: We will supply your end tackle – traces, hooks and weights. If you have your own then extra tackle can be purchased on the boat if required. Payment: Payment is by cash on the boat to the skipper. It is customary to pay your skipper before leaving the harbour. You may be asked for a deposit when you make a booking. What if the trip is cancelled? Cancellations: We monitor the weather and we will be able to confirm your booking the night before your trip. It is your responsibility to call the skipper! If your trip is cancelled you will need to select another date. Any deposit can be refunded or transferred. Can we keep our catch? Bass Limits: There is currently a complete ban on any anglers taking Bass between November and March (inclusive) therefore any Bass caught during that period will have to be returned, dead or alive to the sea. Between April and October you may keep one Bass each per day. Protected Species: Some species of Sharks and Rays as well as other fish such as Silver Eels and Shad are protected. Your skipper will tell you if a fish may be kept or if it should be returned. Other Species: Although it is legal to keep most specimens we recommend returning small or juvenile fish to the water. We also practice only keeping what we intend to eat. It is illegal to sell on fish caught from our vessels. However, if a fish is in-size and good eating then by all means keep it for the table. Do you have life jackets? Safety Equipment: Both boats are fully equipped with life rafts and emergency equipment to MCA category 2 standard and above. Lifejackets will be issued if the skippers deems necessary. Alcohol: Although it is legal for customers to bring aboard alcohol, most regular anglers do not drink on board the boat. This is for their own safety and comfort – alcohol is a contributing factor to sea sickness. We suggest that you enjoy your day without alcohol and then have a drink in the pub when you get back in. The skipper reserves the right to refuse anyone from boarding who might jeopardise their own safety or the safety of others. Novices: Beginners are welcome on most trips although some trips are only suited to experienced anglers. We are used to catering for both experienced anglers and novices. Don’t worry if you’ve never fished before, we will show you how to fish. It’s our job to help you catch and have a fun time! Ts + Cs: Yes, we do have Terms and Conditions. Click here!